If you clicked into this story, the fact that Coachella is right around the corner is not news to you. You have your ticket purchased, your hotel booked, and your pre-festival playlist carefully curated. But I can safely assume that despite all of your proactive planning, your outfits have yet to be set. Instead of doing what most of us are guilty of doing, which is waiting until the very last minute to plan our looks, resulting in spending way too much money on things we probably don't need, this festival season, head to Zara and shop in peace. The fast-fashion retailer currently has an entire section dedicated to festival style, and since Coachella is the first festival in the lineup, we're confident the pieces from this Zara festival collection will be spotted all over the polo grounds. 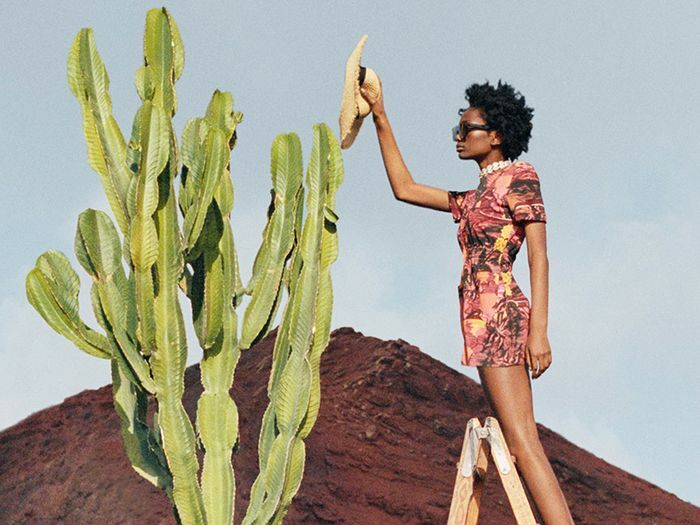 From palm tree-printed dresses to shell anklets, beaded backpacks to cowboy boots, Zara's take on 2019 festival fashion is a step above the rest (and won't cost you more than $100 on average). Ahead, shop the best Coachella-ready items currently available at Zara. If this doesn't scream Coachella, I don't know what does. These anklets are a must. Skip the fanny pack and carry this instead. In case you want a little height sans the discomfort. That's going to be a yes from us, fam. But have you ever seen a wooden backpack before? Because I haven't. Don't forget—the festival can get chilly at night. For the minimalist who's stressed about all the flash tats and fringe she's about to see. Barely there sandals that still make a statement. No added jewelry is necessary with this one. Cheap sunglasses are a must at a music festival because chances are you'll lose them. If there was ever a place to wear overly distressed jean shorts, it would be at Coachella. Wear your heart in your hair. Keep things simple with a sleek yet bright bodysuit. A festival look fit for a true fashion girl. The unofficial Coachella sunglass shape. Everyone will be wearing plain denim jackets, so we think you should get one that's a bit different than all the rest. Vintage-inspired tees are the easiest festival-appropriate piece. Mark our words—cowboy boots will be all over Coachella this year. Wear this when it gets chilly, or tie it around your waist when it's too hot—this is the perfect transitional piece. Your IG account is going to love this. Loving this look—flip-flops and all. This is a bag you could easily wear every day of the festival. Kitschy prints are more than appropriate in the music festival world, and we love this cherry edition. Next up, shop the five travel basics you absolutely need, according to a fashion director.